It has been so long since I've posted. First it was the computer and still is. Can you believe it...7 weeks at GEEK squad? They lost my hard drive but now they say they have and I still don't. Anyway...then my mom got ill. Still is but we are taking good care of her and hoping that even her time here is not very long it will be quality time. She will be coming home to hospice on Saturday. 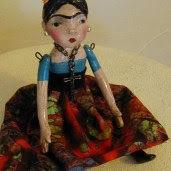 Now onto to what I've been doing in the art field.... here is the doll I posted today on ebay. This took me a long time to finish because of life. Enjoy! Your doll is beautiful! Sounds like you are going through what we are going through with your mother. My husbands 94 year old mother whom I was caring for in our home, broke her leg ten weeks ago, and will be coming back to our home in about three weeks, so it will be back to caring for her as she is an invalid. But your platter has been way more full than mine has. I figured, to just go with the flow of things is about the only thing I can do, with a lot of prayer for the strength I am going to need on a daily basis. But life is good, just the same! We thought 'mom' would have gone by now, but she is a tough old cookie, and a sweet one at that! She has a cousin who is 101 years old, so I am not counting on her leaving this life anytime soon. She does have congestive heart failure and has had a pace maker for eight years. But God knows her time here.